All queries are accepted and many are answered in that same witty prose that has made Ask Dog Lady a hit among its readers. Behind the mask of this doyenne of doggie knowledge is newspaper veteran Monica Collins. 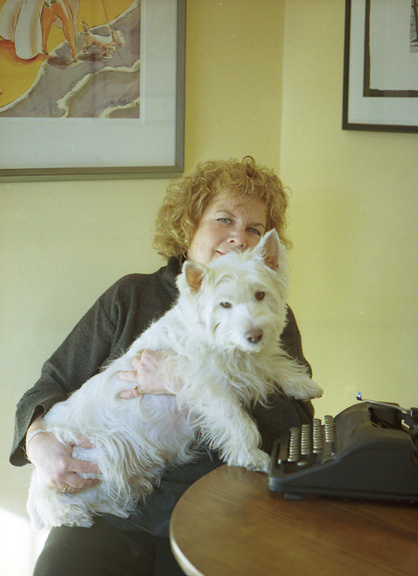 From her Boston home, Collins, who has written for papers ranging from the Boston Globe to USA Today, spins her words on the intricacies of the canine world with the help of her friend and inspiration, Shorty, a West Highland Terrier. So what is Ask Dog Lady? What it’s not is expert advice on health or behavioral issues. Collins, as Dog Lady, leaves that to the veterinarians and trainers. Instead, hers is a humor-filled lifestyle column—a sort of Dear Abby for the dog-loving set. “It’s about the emotional connections, the relationships, that people have with their dogs,” she says. Since creating Dog Lady, Collins has written more than 200 columns responding to well over 600 questions. summer job handling classified ads for The Village Voice. She had gigs at Atlantic Monthly and The Real Paper in Boston before accepting a job as a television critic for the Boston Herald. Collins told her father she was going to get a dog. He was skeptical of the idea. Still, being the analytical type, Collins did a great deal of research before narrowing her breed choices down to two: the West Highland Terrier (Westie) or Scottish Terrier (Scottie). Prepared to go home sans canine, Collins was startled when another puppy came bounding into the room and immediately jumped in her lap. It was love at first sight. She took him home and named him Shorty. The newly formed group dubbed itself the Dog Owners Group, or D.O.G., and began lobbying city hall for certain privileges like off-leash time. The group even had its own newsletter published by Collins. Over time, people left the neighborhood and D.O.G. fell apart. But Collins wasn’t ready to give up Dog Lady. She emailed clips of the column to the editor of a national dog magazine and Ask Dog Lady found a new home. Over time, Collins was able to move the column into the newspaper realm where she felt more comfortable. Today, Ask Dog Lady runs in 14 community newspapers in the Boston area and another in Maine along with a Vancouver-based dog magazine and this magazine. Collins has also developed a wildly popular Web site, AskDogLady.com, that features some of her best columns and provides readers with an easy way to email in their questions. The site averages 800 readers and 8,000 Web hits a day. Collins answers every one of those letters immediately and always the same way: I cannot tell you what to do. She tells the owners to consult with their veterinarian and anyone they would ask advice from. But she says those are the letters that weigh on her the most.